Visible Ink Press : Which superhero is regularly spoofed on The Late Late Show with Craig Ferguson? Which superhero is regularly spoofed on The Late Late Show with Craig Ferguson? While not the most popular superhero, he is one of the few to have stayed in print since he was introduced in the 1940s. He can be defeated if he is deprived of water for more than an hour. His secret identity is Arthur Curry, whose mother came from Atlantis. His superpowers include breathing underwater and communicating with sea creatures. Although he was not the first aquatic superhero, Aquaman is the only one who has been in print almost continuously since his creation in 1941. Aquaman, also nicknamed King of the Seven Seas, first swam onto the scene in More Fun #73, one of several creations of legendary DC Comics editor Mort Weisinger, with art by Paul Norris. The creators covered Aquaman's origin in a mere three panels: His father, an undersea explorer named Tom Curry, discovers the ruins of long-lost Atlantis and sets up home there. From the books and records of that ancient civilization, he teaches his son, Arthur Curry, how to live and breathe underwater (not to mention swimming through the ocean at 100 miles per hour), and how to communicate with and control the many denizens of the deep. Later on, the comic reveals that Aquaman's mother had been an Atlantean herself, truly solidifying Aquaman as a man of the sea. His one true weakness, however, is that he cannot survive for more than one hour without water. But since even the slightest contact with water keeps him alive, the Marine Marvel can also enjoy the life of a crime fighter on land. In 1945, Aquaman moved from More Fun to Adventure Comics, where he stayed until 1961, one of only five superheroes from comics' Golden Age (1938-1954) to remain in print throughout the 1950s. While he started life battling Nazis, most of his strips in this later period were peopled with petty criminals, or helpless fish in need of rescuing. As superheroes came back into vogue by that decade's end, the strip was revamped and a young companion, plucky boy-hero Aqualad, was introduced. Affectionately dubbed "Tadpole" and "Little Sardine," Aqualad learns the ways of the deep from Aquaman, joining his mentor in many undersea adventures. 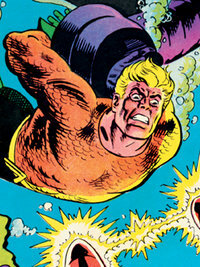 In 1961, Aquaman starred in four issues of Showcase, which led the next year to his own solo comic and an ongoing membership in the Justice League of America. Throughout the 1960s, Aquaman was a stalwart of DC's superhero lineup--albeit a somewhat middle-aged one. Showcase stories had revealed that he was in fact the king of Atlantis, and most of his later strips dealt with threats to the kingdom from other aquatic races, weird beasts, and alien invaders. In short order, he met and wed Mera, a water-dwelling girl from another dimension, and the pair quickly produced Aquababy. Not to be outdone, Aqualad acquired his own love interest, Aquagirl, and became a founding member of the Teen Titans. With solid writing from Bob Haney and elegant art by Nick Cardy, the Aquaman comic was always well crafted, but perhaps lacking in excitement. During this period, Aquaman jumped from print into various cartoon shows--first during the 1967-1968 CBS season with Aquaman (voiced by Bud Collyer, who also voiced Superman for radio and television) and then, in 1970, on The Superman/Aquaman Hour. Aquaman comics published at the end of the 1960s saw a punchier, more ecologically-inclined approach from Steve Skeates and Jim Aparo, but the comic was canceled in 1971, and Aquaman was reduced to regular appearances with the Justice League. However, a few years later, following the sudden cancellation of the controversial Spectre strip in Adventure Comics, Aquaman was rushed back, along with his last creative team, to fill the gap. This led to a short-lived revival of his own comic, which culminated in the unexpected and shocking murder of Aquababy by arch-villain Black Manta. In time, cancellation was followed by backup slots and a starring role in the long-running (1973-1986) Super Friends cartoon series.To the present day, DC has managed to keep the character in the public eye in one way or another. Following the death of their son, Mera and Aquaman parted company, and the 1980s and 1990s witnessed a gradual hardening of the hero's personality, and grittier stories. One (of many) 1980s miniseries introduced a new, camouflaged costume to replace his old, fish-scale-covered, green-and-orange getup. This run led to a regular series in 1991. Its ecological theme proved no more popular than the previous, late 1960s attempt, but a third series in 1994 met with more success. In a reflection of the current popularity of violent anti-heroes, Aquaman now grew his hair long, sported a straggly beard, lost his left hand, and had it replaced by a harpoon! Mera and Aqualad were back on the scene, but Aquaman's main love interest was Dolphin, a previously obscure water-breathing girl, from the pages of Showcase some twenty years earlier. At seventy-five issues, this was the title's longest run, and it was followed after a year's break by a fourth series in 2002. It now seems that Aquaman has been forced into exile following a coup, and is reduced to living in freshwater areas, where he has acquired magical powers (and a replacement left hand) from the Lady of the Lake. In a storyline by writer Kurt Busiek, Aquaman became the mysterious Dweller of the Depths, who mentored a young successor to his role of Aquaman. The original Aquaman was killed, but he was resurrected in the series Blackest Night (2009-2010), with his original hand restored. The original Aquaman stars in a new ongoing series that debuted in 2011, written by Geoff Johns and drawn by Ivan Reis. Aquaman has had a surprisingly strong presence on television in recent years. Played by Alan Ritchson, Aquaman appeared in several episodes of the live action series Smallville. A bearded, comically boastful version of Aquaman has made many appearances on the animated series Batman: The Brave and the Bold. A long-running storyline on the HBO series Entourage concerned the making of a fictional Aquaman movie. And comedian Craig Ferguson impersonates Aquaman in the "Dear Aquaman" segments of The Late Late Show with Craig Ferguson on CBS.